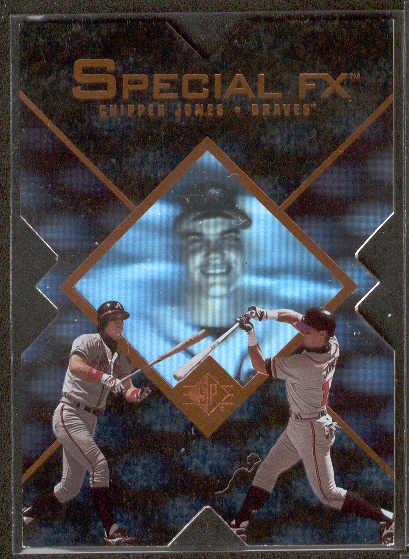 I haven’t posted much in the past few days, partly because I haven’t had much to write about and partly because I’ve been eagerly anticipating the arrival of one the most sought-after boxes on my personal wantlist, 1997 SP (image from chippercards.com). 1997 SP is an extremely difficult box to find and is chock full of inserts but the main attraction is, without question, the autographs. There are SPx Force autographs which are single-player autographs on multi-player cards designed like 1997 SPx. To show how much of a demand there is for these cards, a Todd Hollandsworth sold for $35! The other autographed attraction is the buyback “Vintage” autographed set. Select cards from the first four years of SP (1993-96) were signed, hand-numbered, and inserted into packs with a separate certificate of authenticity. The numbering on these cards ranges from 4-367 copies! There are 32 cards in this set including Alex Rodriguez, Tony Gwynn, Jeff Bagwell, Chipper Jones, and Ken Griffey, Jr.
Now do you see why I want this box to get here already? As you can probably tell, I haven’t had much time to update this thing recently. Rather than bore you with details about that, let’s get right into the next box break, which happens to be of Pinnacle’s flagship brand of 1997. You know what that means….dufex!! Base set: The base set is comprised of 200 cards: 185 regular cards, 12 Clout subset cards, and 3 checklists. I pulled a complete set in this box with 34 duplicates. Each base card features a gold foil nameplate which sits atop an area filled with names associated with the player’s home city. Take for example, Todd Hollandsworth (LA), whose card contains the names “Hollywood, Sandy Koufax, Don Drysdale, The Lakers, Vin Scully, Chavez Ravine, La Brea Tar Pits” and so on. The first is a classic bubblegum shot of Jeff Cirillo while the other is a very sweet card featuring Scott Brosius and his daughter. This card happens to be Mr. Brosius’ personal favorite. Museum Collection (1:9 packs): Inserted at roughly three per box are the dufex-laden Museum Collection cards, which mirror the entire set. My pulls were of Brett Butler, Mark Thompson, and Frank Rodriguez. I didn’t exactly get any big stars here, but I suppose I could save the Butler for Mr. Owl. Shades (10 cards, 1:23 packs): If you’ve ever wanted an extreme close-up of your favorite player’s facial hair, this insert is for you. Inserted at a rate of one per box, these cards are die-cut at the top and feature smaller pictures of the player in the lenses of the glasses. I pulled a Mike Piazza. I’ll be honest. I find these inserts to be downright weird. Passport to the Majors (25 cards, 1:36 packs): The Passport to the Majors inserts are truly unique. These inserts fold out like a real passport and feature players from the USA, Japan, Korea, Dominican Republic, and Canada among other places. My pull was of Chipper Jones. Interestingly enough, this theme was later used by Topps as a game-used set in 2002 Stadium Club. Check out the inside of this insert! Collation: A. I can’t complain with completing a base set with one box. The other inserts also delivered as promised. Condition: D. Despite the fact that I did complete the base set, a number of cards had deteriorating foil on the front. For example, look at the nameplate of the Jeff Cirillo card above. In some cases, the damage was even worse! Pulls: B. The Piazza and Chipper were cool, but it would’ve been nice to hit some better Museum cards. Plus, I had to take points away for the fact that I pulled Chipper in the first place. Just kidding…. Value: B. For $15, one could expect to complete a base set and pull about five or six inserts/parallels. I know the base set looks a bit crappy, but it was still a fun little box to open. Final Grade: C. The condition factor dropped this box’s grade to a C overall. I could’ve possibly given the box a C+, but damaged cards (even if they’re just base) are a huge, HUGE peeve of mine. Just my opinion.